Ultra pure quantities of the element Lithium (atomic number 3), ideal for element collectors of those conducting experiments/producing alloys with pure Lithium metal. Lithium is a very soft metal that can easily be cut with a knife. It reacts violently with water, liberating explosive Hydrogen gas and igniting it. It is a flammable metal and can cause severe burns if it comes in contact with the skin. This material should only be handled by those familiar with its properties. Lithium is shipped in a poly bottle under Mineral Oil within a metal can. Lithium is a very lightweight metal (so lightweight, that it actually floats on water). 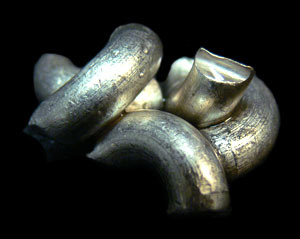 Elbow macaroni shaped - several pieces included, total weight: 5 grams. Caution: Use safety precautions (wear eye protection and gloves) when working with Lithium metal. Violently/explosively reacts with water and may ignite on contact with air. Causes severe burns on contact with body tissue. See MSDS link below. Note: adult signature required upon delivery.